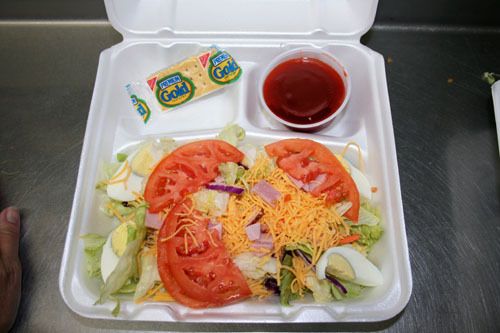 Iceburg Lettuce With Ample Amounts Of Ham And Chedder Cheese, Then Topped With Tomatoes And A Hard Boiled Egg. Served With Club Crackers And Your Choice Of Dressing. Iceburg Lettuce Topped With Our Homemade Meat Sauce, Salsa, Chedder Cheese And Tortilla Chips. A Large Amount Of Iceburg Lettuce And Served With Club Crackers And Your Choice Of Dressing.